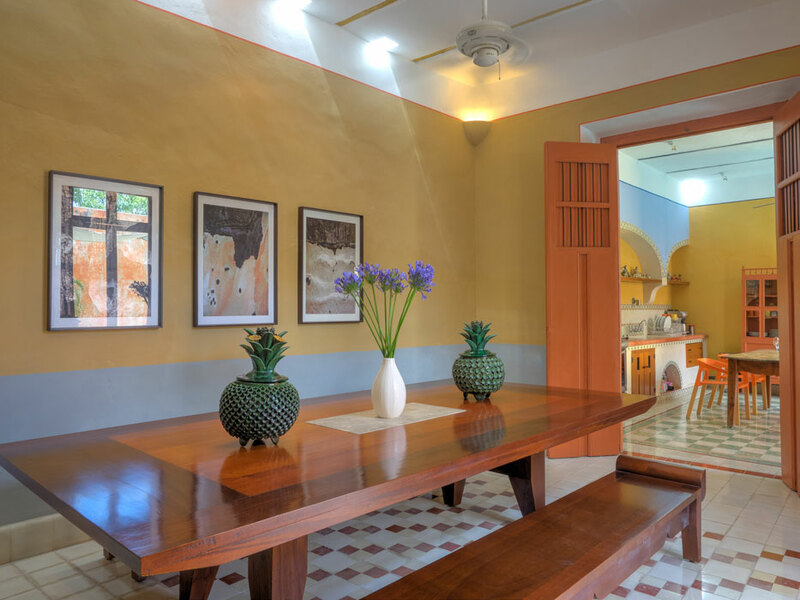 The award winning architect Salvadore Reyes Rios designed this luxurious private home with many of the same features he applied contemporaneously when renovating the Hacienda Petac and Starwood’s Hacienda San Jose Cholul. 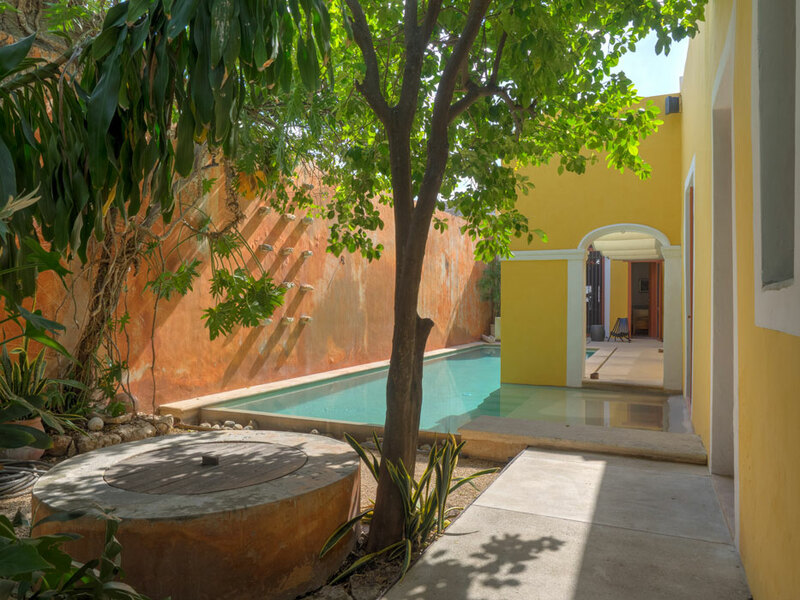 His work is very prominently featured in the book CASA YUCATAN as well as LIVING IN MEXICO. 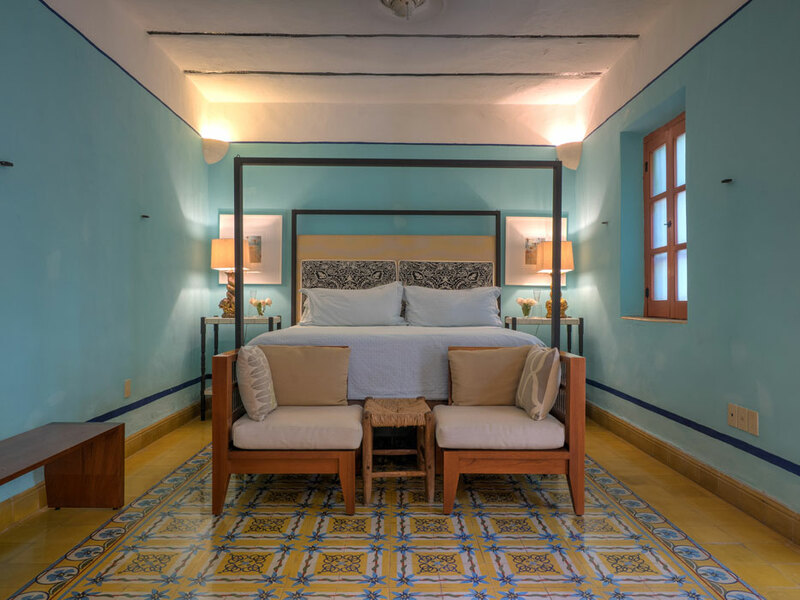 Casa Azul de Santiago is one of his first and most beautiful Colonial home renovations in the Yucatan. 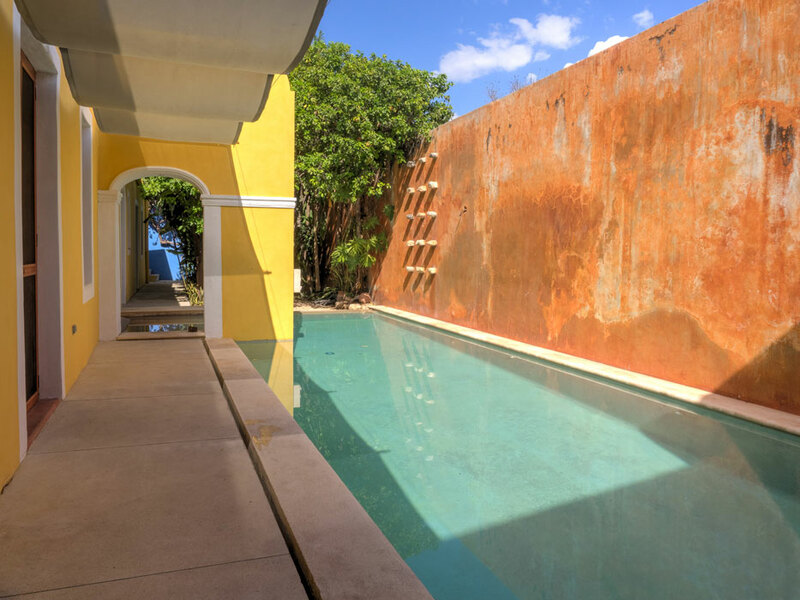 The infinity edge pool in the garden is visible from most of the rooms as the house wraps around the pool. In the mornings you can shop for provisions among the exotic fruits and fresh flowers of the market on the near corner. 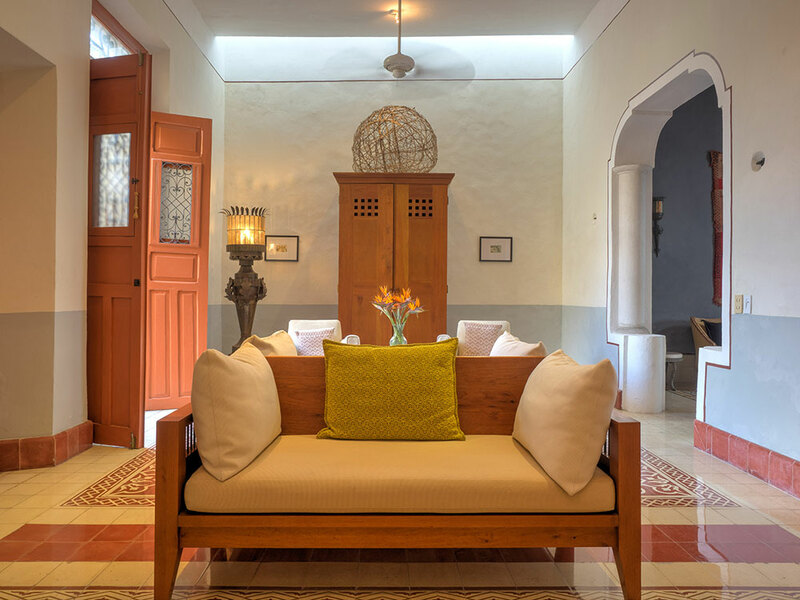 Evenings will find you on the refreshing roof terrace with a view overlooking the park and facade of Santiago Church. Santiago park is a favorite among locals for the Tuesday night concerts of big band salsa and swing music. We like to eat at the market stalls and restaurants in the Santiago market while watching the local couples dance. The Zoo at Centenario Park is a short walk down a prominent boulevard. The location makes this house a favorite among families with small children. France had the most influence on the culture and architecture in the Yucatan in the 19th century. 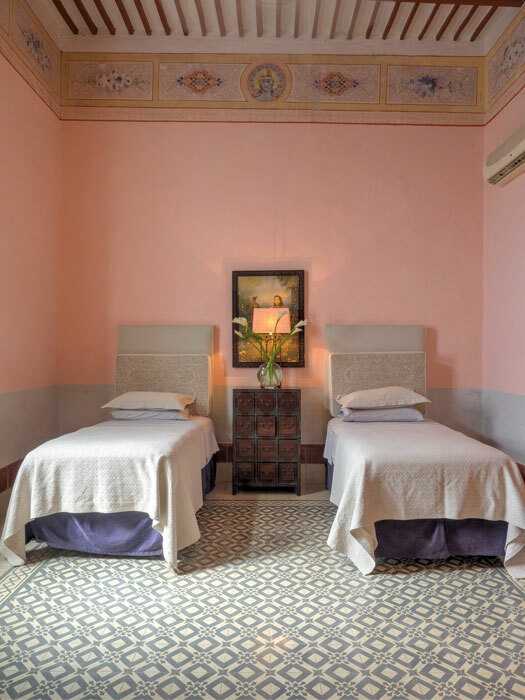 This house features the French influence in the neo-classical facade, and original stenciled wallpaper design hand painted frieze in the front bedroom. 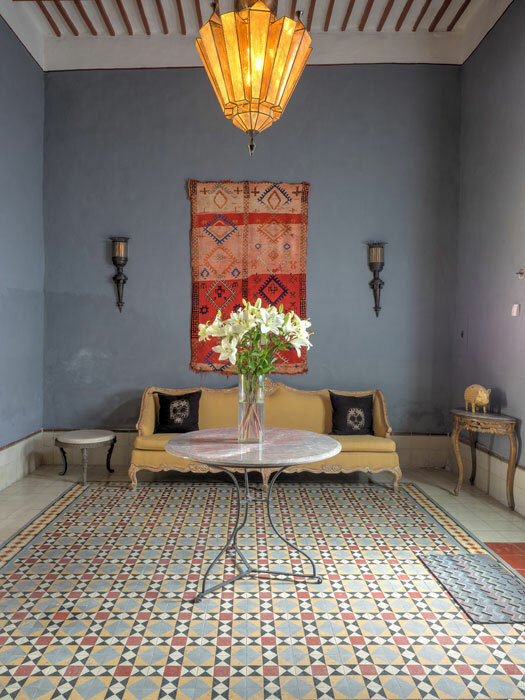 The floor tiles originated in North Africa and Marsaille and they are now made in the Yucatan. 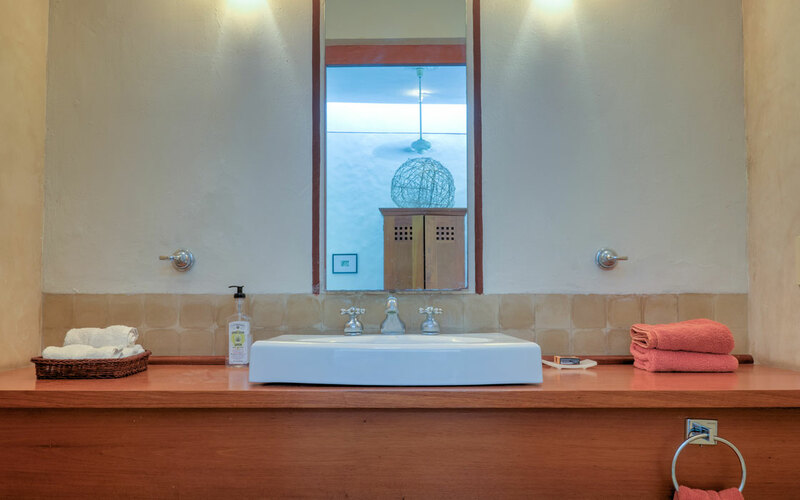 The house offers a lot of privacy for two couples vacationing together or with kids. The front hall opens onto the bedroom to the left and to the living room. The guest room with the double beds also has a nice large full bathroom. 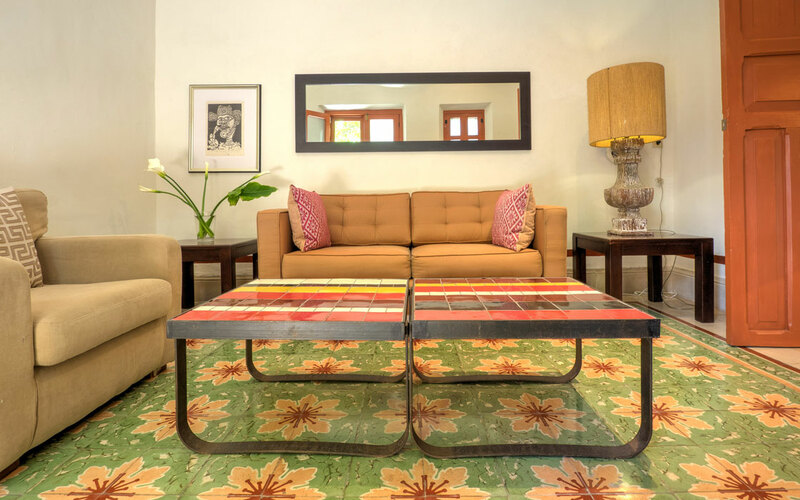 The spacious living room features the modern furniture that Reyes Rios designed specifically for this home including a conversational sofa. There are pool and garden views from most rooms in the house. The dining room table seats 12 or 14. 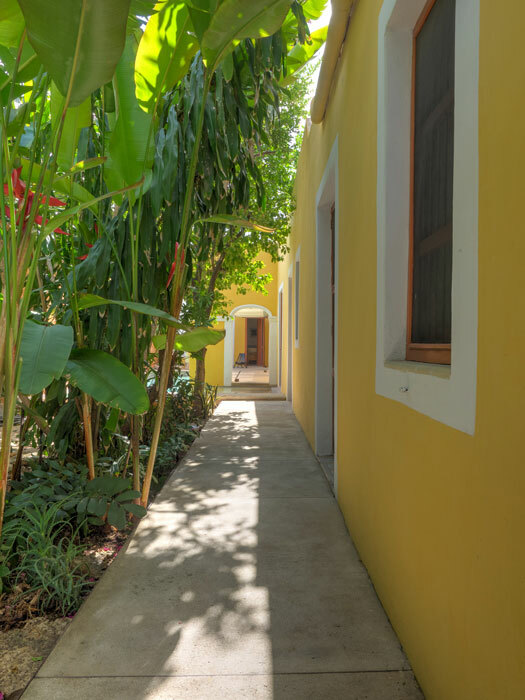 It is a great house for a party and that is what the owners had in mind when they renovated this beautiful vacation home. This house is dangerously addictive. Some guests to return over and over again. If you are not a group of 14 to dine or doing an enormous crossword puzzle on the huge dining room table you may choose to dine “en famille” in the kitchen. 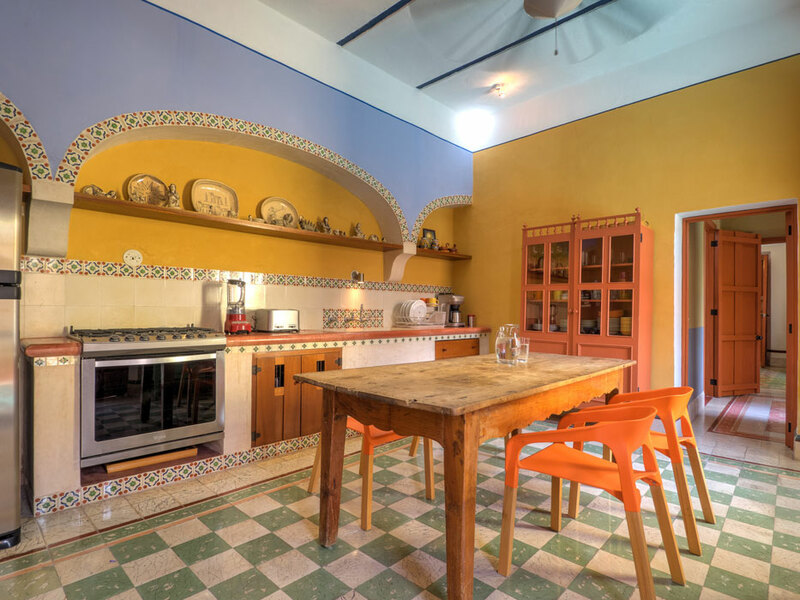 The traditional Mexican kitchen with it’s beautiful hand painted tiles and is fully furnished with new and modern appliances. Beyond the kitchen is a more private wing of the house that borders the garden. There is a comfortable large modern bathroom. Then the master suite which includes a sitting room with cable TV and high speed Internet connection. The master bedroom has a very comfortable king size bed. 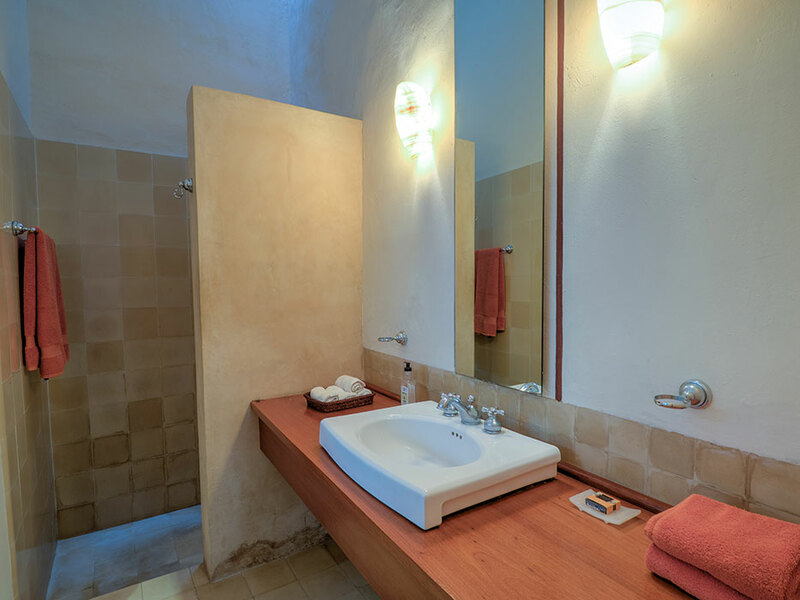 It is the fantastic pool that is the soul of this luxury holiday villa. 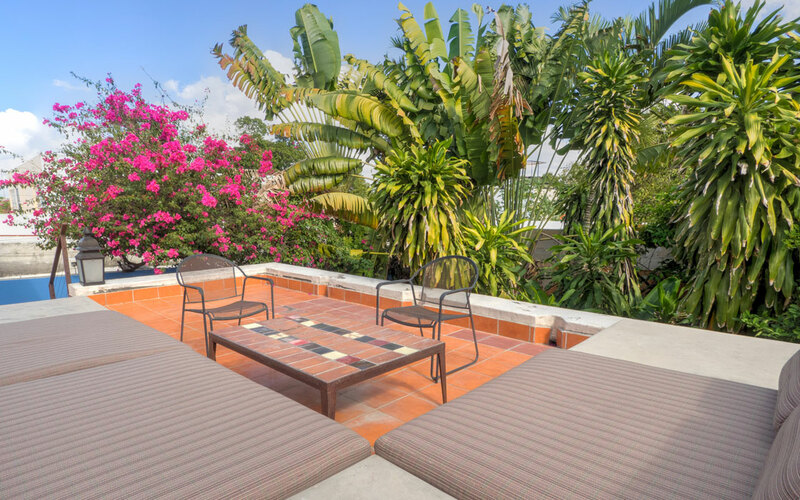 Enjoy the pool in the shade of the morning or afternoon when you can sunbathe up on the roof terrace and cool off in the pool. At mid-day the pool does have direct sun. This house was featured in Conde Nast Traveler, May 2017.